Please note that this information is also available as an accessible Word document. Are you able to navigate the website with a keyboard only? This checkpoint is important for people with mobility impairments and people using screen readers. They may not use a mouse to navigate the website. Put your mouse under your desk or somewhere where you cannot reach it. Hit tab. 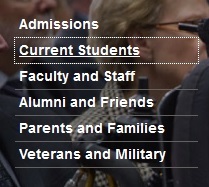 Continue hitting tab to see if you can continually access all of the content on the webpage. Be sure that items in drop down menus are either usable from the keyboard (using the Tab or arrow keys) or that all of the information that is in those drop down menus is available on the destination page for the main menu item. Can you see where the tab focus is? People who have mobility impairments who are navigating the website using only the keyboard need to be able to see where they are throughout the page, just like a mouse cursor indicates where you are on the page. When you are tabbing through your webpage, check to see if there is a box outline, an underline, or font color change to indicate where you are on the webpage. Is there alternative text on images? If you don’t supply alt text for the image, a screen reader will read whatever the image title is versus describing what the image actually is. 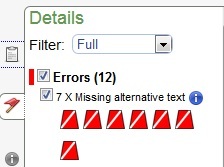 Screen reader software cannot interpret a graphic image, so the image needs to be described in alt text (alternative text description). Enter the URL for your webpage. On the left side of the screen, click on the flag tab underneath the clipboard tab. Is there a video on this page? If so, does it have accurate closed captions? People who are deaf or hard of hearing need captions to understand what is happening in a video. If the video has captions, turn the volume on the video totally off. Hit play. Watch the video without sound. See if you can fully understand the message from the captions. Are the hyperlinks on the page descriptive and non-repetitive? People who use screen readers often have their screen reader present them with a list of links. A hyperlink that says “Read More” doesn’t tell them where that hyperlink leads to. Do any hyperlinks that have the same text lead to different places? For example, two hyperlinks that are “Read More” but lead to different destinations? 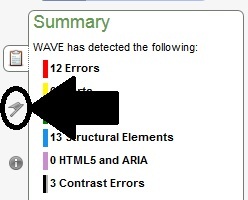 Check for hyperlinks that are shown simply as the URL rather than displaying a description of the destination page. 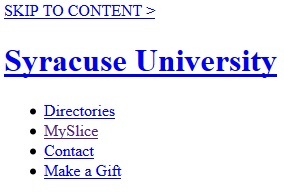 For example, use Syracuse University Libraries rather than http://library.syr.edu. Can you zoom in on the page without losing information? Can you zoom to 200% and still navigate the webpage? People who have trouble reading small text will often zoom in to see the text. If information is outside the scrolling region when zooming, they cannot get to that information. Press Control and + together until you have doubled the zoom percentage. Check and see if any information on your page is lost. 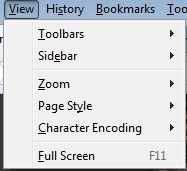 Tab through the page and make sure that everything on the page is still accessible in zoom. Is there a ‘skip to content’ or ‘skip navigation’ link? People who use screen readers don’t want to have to listen to the navigation at the top of each webpage if it remains the same on each page. Having a ‘skip to content’ link lets them jump over the navigation, just like scrolling down a page to the main content would. 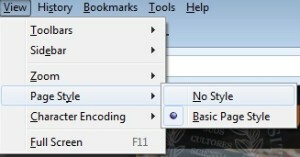 If the hyperlink is there, tab to it and press Enter to make sure that it works. If it skips to the content, continue tabbing to make sure that it tabs through the content.